Asia's two giants are headed in opposing directions, with the China slowing down as growth in India picks up. 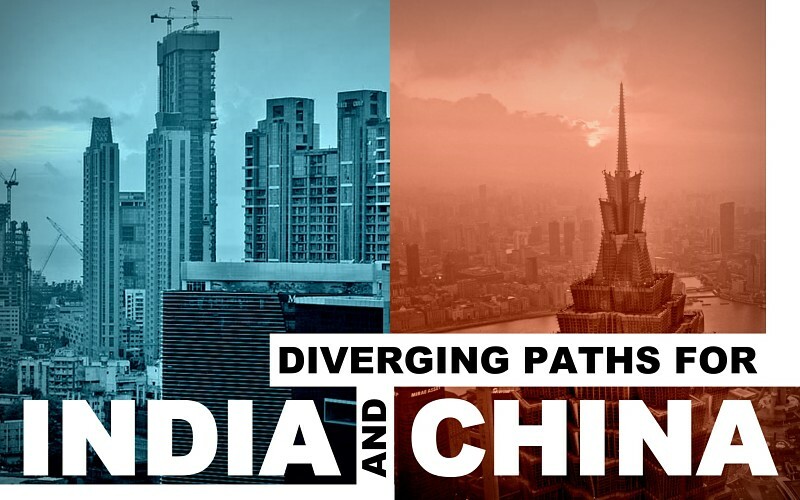 China is in the midst of a structural shift toward more sustainable growth, while India, where income remains at a modest level long since vacated by the China, has more scope for rapid growth. As China policy makers pursue a smooth transition to more moderate growth, their Indian counterparts strive to maximize growth. In the China, policy makers continued last year to focus more on growth quality than growth quantity, and on rebalancing the economy and eliminating excess capacity to target growth at about 7% (emphatically not a more precise figure) through fiscal stimulus and monetary easing. Growth in the China decelerated from 7.3% in 2014 to 6.9% in 2015, but it continued to account for about a third of global growth. In India, structural reform intended to attract more foreign direct investment is gradually moving forward, but further reform is needed to raise private investment and lift potential growth. Strong public investment helped India’s economy accelerate growth from 7.2% in 2014 to an estimated 7.6% in 2015, the fastest rate among the region’s larger economies. However, a challenging external environment is likely to moderate growth in both India and the China this year. The difficulty of sustaining high growth in industrial production is manifest as the efforts of the China to rein in excess capacity are bedeviled by soft global demand. Further, production has been kept in check by an uncertain business outlook, especially for heavy industry. Industrial production slowed to 6.1% in 2015 from 8.3% in 2014 (Figure 1). Production was held down by a less upbeat business sentiment as, from August to December last year, the purchasing managers’ index (PMI) languished below 50 (Figure 2.). Meanwhile, growth in industrial production decelerated in most months in tandem with declining manufacturing exports. The continuing slowdown in industrial production reflects deep corrections in traditional heavy industries. In January and February this year, the PMI continued to linger below 50 as growth in industrial production further weakened to 5.4%. The expected slackening of manufacturing growth will be pronounced in heavy industry, while growth in consumer oriented manufacturing is likely to hold up better. The government will continue to eliminate excess capacity in manufacturing as part of its structural reform. The likely moderating impact of reform and the weakening of growth momentum overall are forecast to bring gradual deceleration over the next 2 years. In India, growth in industrial production accelerated in 2015, boosted by robust domestic demand. Industrial production expanded by 3.2%, up from 1.9% in 2014. The PMI registered a solid reading in most months, but business sentiment waned by year-end, when a PMI drop to 49.1 marked the first time since October 2013 that it fell below 50. A slide in the manufacturing PMI in December reflected a less favorable outlook on domestic demand exacerbated by floods in the southern part of the country, which affected a major automanufacturing hub. A decline in merchandise exports also worsened during the final quarter of 2015, further undermining business sentiment. The PMI recovered to 51.1 in January and February this year, along with expectations of an improvement in domestic demand. However, data on industrial production produced a contrasting picture, as it showed contraction in January for the third consecutive month. In sum, GDP growth in India is expected to dip marginally this year as expansion in public investment weakens under fiscal constraints, private corporations continue to deleverage, and external demand remains anemic. Asian Development Outlook 2016 - Asia's Potential Growth. © Asian Development Bank. https://openaccess.adb.org. Available under a CC BY 3.0 IGO license.